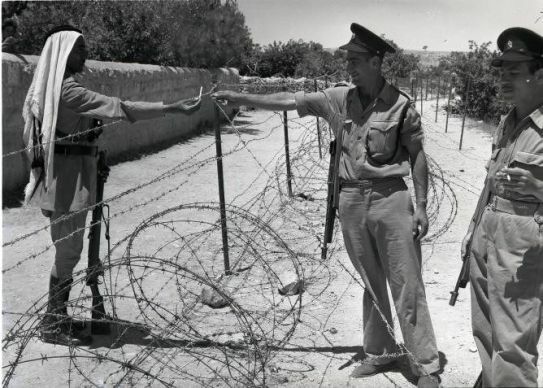 Fifty years have passed since the Green Line in Jerusalem, part of the longer Green Line separating Israel from Jordan between 1949 and 1967, was officially annulled. Three weeks after the Six-Day War the Knesset approved, in a deliberately bureaucratic and semi-covert operation, the annexation of East Jerusalem and the unification of the city. Since then Israel has invested enormous efforts – economic, engineering and rhetorical – into effacing the Green Line to prove to the world and itself that the line has disappeared and the city is united for “all eternity,” as the cliché goes. But did this endeavor succeed and is it truly impossible to discern the Green Line in the Jerusalem of 2017? What remains, if anything, of the line that divided the city for nearly two decades? What implications does the line have for the city’s future? To answer these questions I went two weeks ago to a green valley in the south of the city to start my search. On a mountain bike, I rode 27.2 kilometers (16.9 miles) from Itamar Spring in the city’s south to Mitzpeh Neftoah in the north. The route was indirect, crisscrossed by buildings, roads and fences, but municipal geographers and architects would still be able to make out the old border by the gas stations, bus parking lots and highways nearby. It’s clear that despite the border's short life it left its traces in the city’s DNA. The main question is whether it remains part of the political reality. In other words, is Jerusalem really united? The start of the trip was easy. I pedaled along a dirt road with the railway tracks and old border to my right. Heading north there were always Palestinians to my right and Israelis to my left. The road in this section winds 200 meters (219 yards) east of the tracks it was built that way so trains could run safely on the Jerusalem-Tel Aviv line. Itamar Spring is named after Itamar Doron, a Breslau Hasid who was murdered in October 1998 when two Hamas members shot at him and another person bathing there. From there the trail carries on until it reaches the Ein Lavan spring. The two springs belonged to the village of al-Walaja until its demise in 1948. Nearby is the third and largest spring in the area, Ein Haniya. Two weeks ago work resumed on the unfinished separation barrier surrounding al-Walaja on all sides, leaving only one opening toward the Palestinian town of Beit Jala. Residents believe the barrier is meant to keep them away from their land and the springs, which are currently undergoing a massive rehabilitation. The plan is to include them as major attractions in Jerusalem’s new metropolitan park. A naive biker could ride by oblivious to these problems while enjoying the greenery, ancient terraces, pools and birds. As the line enters the built-up area of Jerusalem it’s harder to identify. Wide roads, neighborhoods, fences and walls have long since covered the old border, so riding along it is a mission that requires frequent searches on a map. Israeli maps tend not to show the Green Line in Jerusalem, but now we have Google Maps, which takes great care to do the opposite. Either way, it’s those gas stations and bus parking lots that help you figure out where the old border was. They were put there, often many years after the war, in the former no-man’s-land. The first gas station among many sits across from the new stadium built in the Malha neighborhood. From there the line passes along a dirt road through a neglected area full of old discarded cars dismantled for spare parts. This leads all the way to the village of Beit Safafa. The poet Haim Gouri once called it “the funniest village in the world.” His trip along the border in 1962 was similar to mine he wrote about it in the army magazine Bamahane. The reason for his comment was that for some reason the Green Line was drawn up so that it split Beit Safafa in two, dividing it between Jordan and Israel. Most likely the people drawing the line, Moshe Dayan and Abdullah el-Tell, the Arab Legion commander in Jerusalem, couldn’t imagine that a cease-fire line would become a political boundary for nearly two decades and determine the limit of Israel’s legitimacy in the eyes of the world for another 50. Today, as then, Beit Safafa is unquestionably the calmest village in the Jerusalem area, just as Gouri describes it. Most of the houses there were built with a permit, the bakery and shops are full of Jews, and its residents speak excellent Hebrew. One resident even complained to a Haaretz photographer that people just go on talking about the occupation. “Enough already, nobody cares,” he said. From the village, the old border continues along Harechev Street in the Talpiot industrial area, a dingy street full of small auto repair shops. From there the line climbs the hill to the enclave of Kibbutz Ramat Rachel. On the way up I pass two gas stations and another parking garage for buses. The old border separated the kibbutz and its archaeological site from the adjacent Arab village of Sur Baher. This high hill was occupied by Jerusalem’s rulers for generations, from the times of Hezekiah, King of Judah, to the Persian and Hellenic periods. Some 2,000 years later the British took over an adjacent hill (the Hill of Evil Counsel now the Armon Hanatziv neighborhood) and set up the Mandate commissioner’s headquarters. It’s obvious why. From these heights they could observe the unruly city to the north. The Jordanians set up one of their biggest outposts in the same area; the last remaining minefield was only cleared in the 1990s. During recent construction work in the area, the skeletons of three Jordanian soldiers killed in 1967 were discovered. Israel’s forensic authorities, worrying about diplomatic repercussions, complained that the skeletons were treated disrespectfully by the ultra-Orthodox group Zaka that retrieves body parts after terror attacks. On the hill next to Kibbutz Ramat Rachel, a symbol of the border was erected by artist Ran Morin – a sculpture consisting of three olive trees planted on tall columns. Sur Baher lies on one side, Ramat Rachel on the other. After circling the sculpture I continued on to the Arnona neighborhood, overlooking the sharp drop to the Judean Desert and the Dead Sea on my right. From that vantage point the new U.S. Consulate was completed in 2010; it was built so that it could become an embassy if necessary. This is one more problem facing Jerusalem. It may be hard to find the Green Line, but it’s clear on lots of maps and diplomatic documents. On this front Israel has suffered a glorious defeat in its attempt to erase the line and gain some legitimacy for the city as its capital. Even Donald Trump has balked at moving the embassy to Jerusalem. Across the road from the consulate is the house of Nobel Prize-winning novelist S.Y. Agnon, who died in 1970. In 1967 he was one of the signatories of a manifesto calling on Israel to keep the West Bank and settle Jews there. “The Israel Defense Forces’ victory in the Six-Day War has ushered the nation and state into a fateful new period,” the document read. From there I continued to Beitar Street, where many years ago the old orchards belonging to the kibbutz were uprooted and the neighborhood New Arnona was built. The old border then passes along the wall of the St. Claire Monastery, reaching another formerly divided neighborhood, Abu Tor. Here the division is very obvious. Jewish Abu Tor is well-manicured, while its Arab neighbor across the invisible line is poor, dirty and neglected. At the exit from Abu Tor, the Green Line drops into the Hinnom Valley; gehinnom provides the origin for the Hebrew word for hell. Today this is a lovely green valley in the middle of a city. I descended into the valley and ascended on the other side to Mount Zion. In a few years this stretch will be easier due to a bridge planned by the Elad nonprofit group which helps settle Jews in East Jerusalem. Mount Zion preserves an unusual aspect from the days when the city was divided; it was a no-man’s-land between the 1948 and 1967 wars. During that time, Israel turned the hill into a sacred site, an alternative to the Western Wall that remained out of reach. The emphasis was put on King David’s Tomb, near where the first Holocaust museum was established. Annual ceremonies were held there, attended by chief rabbis and other dignitaries. 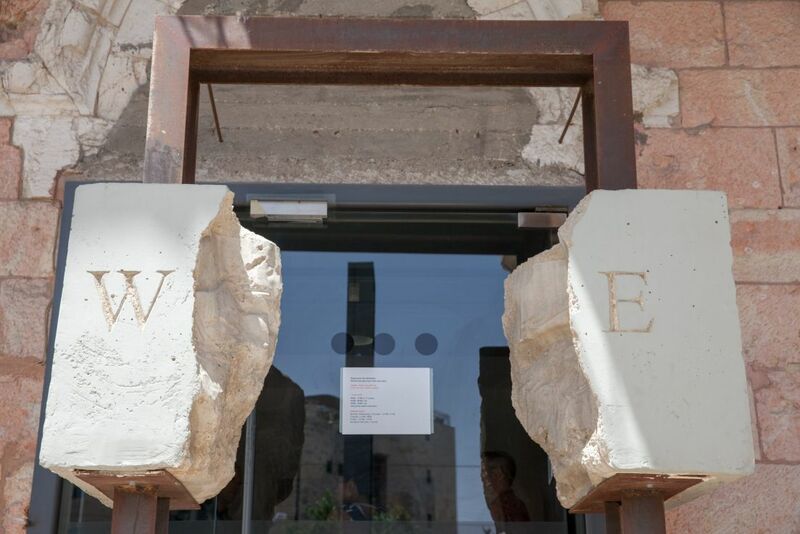 The place was forgotten after the Western Wall was liberated, but recent years have seen the reemergence of the controversy over David’s Tomb and Christians’ right to use the Cenaculum, which Christians believe was the site of the Last Supper. It’s right above the tomb inside a Crusader church. The conflict over the site was marked by the smashing of Islamic-period ceramic tiles that adorned the tomb; that destruction in 2012 sought to erase any memory of the building’s Islamic period. From Mount Zion the border winds along the Old City’s walls through bullet-riddled Zion Gate, the gate through which a failed attempt to save the Jewish Quarter in 1948 was launched. It leads to Jaffa Gate, which teems with people; when I was there a bevy of Turkish tourists were trying out the stores and restaurants. In one coffee shop I met Ahmed, a Palestinian from the A-Tur neighborhood who works for the Jewish National Fund, which runs the country’s forests. As part of his job he has become an expert in putting out forest fires. In the conflagration on Haifa’s Mount Carmel in 2010 he lost his hair and eyebrows. A week before our meeting he was urgently called to put out a fire caused by military exercises near a base in the West Bank. From Jaffa Gate I continued along the walls to the New Gate. This was the site of the convent of the Sisters of Marie Reparatrice, a French convent that abutted the wall until it was blown up by the Haganah in 1948 to block a Jordanian armored column threatening West Jerusalem. The Green Line joins the new light rail line at this point. When the tracks were being laid in 2009, a British army whistle and full perfume bottles from the convent’s gift shop were found. From there the line descends to Damascus Gate, the most magnificent of the Old City’s gates that now alas is known as a common site for terror attacks. Over the last two years, 20 stabbing attacks have plagued the gate and the plaza facing it. This is also where East Jerusalem’s central bus station is located. 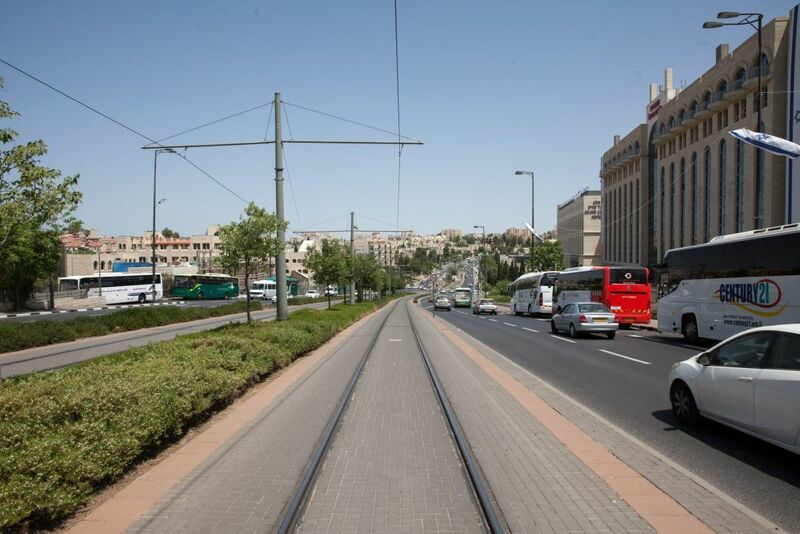 Yes, Jerusalem has two totally disconnected transportation systems. Buses in the east of the city are painted white with green stripes. Right here the border between the city’s two halves rears its head. For the next kilometer and a half the old border is quite clear. On the right are Musrara and Bab al-Zahra, the heart of Arab East Jerusalem, while on the left lie the Jewish neighborhoods of Musrara and Beit Yisrael. The green pencil used by Dayan and el-Tell was blunt and thick, leaving large areas of no-man’s-land that allowed the paving of the wide road that divides the city. On maps it is called Bar-Lev Road, but Jerusalemites call it Route 1. People who still believe Jerusalem can be divided see this road as the key for getting it done. This road, running parallel to the light rail tracks, is difficult to cross. Architects Yehuda Greenfield-Gilat and Karen Bar-Sinai, who designed a plan for dividing the city as part of the 2003 Geneva Initiative, proposed that this road, as well as the Old City walls, serve as a natural urban limit the kind that exists in other cities. All that remains is to raise and improve the fence that sits between the road and railway tracks, and to install cameras and other deterrents. Then you’ve got a border between two states. Until this border is put up, if ever, you can notice the old border at the traffic lights at the corner of Route 1 and Naomi Kiss Street. Every day at 2 P.M. the police hang nylon strips on these posts, prohibiting a left turn. This has been going on for years. First a police van blocked the left turn, now the strips, which are removed at 5 P.M. This is supposedly intended to relieve congestion on the main road, but actually it inconveniences Arab drivers. This is further testimony to the fact that the city’s division is not a geographic one, not an easily visible one, but one present in the minds of decision-makers at police headquarters, city hall and government offices. More importantly, it’s present in the minds of Jerusalemites. Anyone living in the city realizes that there’s a separation between residents on its two sides, even if it’s hard to concretely visualize it. In any case, I continued along the light rail tracks and passed the Museum on the Seam. This was set up in Turgeman House, which served as an Israeli military post between the wars. The balcony, shattered by shells, is the museum’s hallmark. This is where Mandelbaum Gate used to be, the crossing point between the city’s two parts in the years of division. All that remains is a big column with a sundial. A few hundred meters from the gate, Greenfield-Gilat and Bar-Sinai planned a bridge and a large border-crossing-terminal between Israel and a new Palestinian state. In the meantime, a big yeshiva has been planned for the site, but its construction is being delayed at planning committees. I continued riding through the Ramat Eshkol neighborhood and passed Ammunition Hill, a symbol of the Six-Day War. This week Benjamin Netanyahu will stand here, as he does every year, and swear that Jerusalem will always be united. Last year the prime minister shared his childhood memories with the audience. He talked about “the marble games, Jaffa Street, Ben Yehuda Street, Allenby Street and many other memories from our charmed childhood.” Funny, there has never been an Allenby Street in Jerusalem. From Ammunition Hill one descends into Ramat Eshkol, the first Jewish neighborhood to be built beyond the Green Line. The declared intent was to erect a “northern buffer,” a Jewish area that would divide the Old City from Arab neighborhoods to the north while connecting the west of the city with Mount Scopus. The government has never abandoned the conception of Jerusalem as a chessboard on which construction is carried out to block, isolate or surround an “enemy” neighborhood, or even to punish it or prove something to someone. During the Obama years the Green Line returned in force to planners’ maps because every approval of construction for Jews beyond this line triggered a crisis with Washington. From Ramat Eshkol a steep path descends to Tzofim Stream, making its way west from French Hill. In the dry stream bed a bike path surrounds the city on the north, west and south sides. It’s well paved and pleasant to ride on. I rode fast, ascending to the Ramot neighborhood, built almost entirely beyond the Green Line. One small and famous section of the neighborhood lies within Israel. This is the Mitzpeh Neftoah observation point, the last green hill in the Jerusalem area, over which a bitter struggle has been waged for years. Developers want to build a new neighborhood there, but local people want to protect the gazelles, porcupines, foxes and the dozens of types of birds, not to mention the hundreds of types of plants that grow there. This is where the trail ends, with the Green Line leaving Jerusalem. In many respects the line has been successfully effaced; the large neighborhoods built to its east and the large infrastructure projects that cross the city have erased the line from maps. The neglect of East Jerusalem, the fact that no decent industrial zone was erected there so that the labor market for Palestinians in Jerusalem lies mainly in the city’s western Jewish sections, has also helped erase the line. Paradoxically, construction of the separation barrier also helped wipe out the line. As long as al-Quds, the Arabic name for the city, was the West Bank’s cultural, economic and political center, East Jerusalem maintained its status as a city that lay on the other side of the Green Line. The enforced separation from Palestinians in the West Bank pushed Jerusalem’s Arabs to the west, where they would seek work and studies. This contributed to the unification of the city on a day-to-day basis. And yet the line remains. The Green Line will exist as long as that police van keeps coming every day at 2 P.M. to Naomi Kiss Street. It will remain as long as Palestinians in the city aren’t allowed to vote in Knesset elections, as long as they are shortchanged in every item and subitem in municipal and state budgets. It will remain as long as 80 percent of East Jerusalem’s residents continue to live in poverty and 80 percent of houses there are built, from lack of choice, without a permit. It will remain as long as sewage from the eastern neighborhoods flows untreated down the Kidron Valley. It will remain as long as the vast majority of East Jerusalem residents feel they live under an oppressive foreign government. Under an occupation.